Post subject: Getting too hot? Wondering if someone is familiar with antique OBs. I bought this 2.5 hp Johnson, supposedly for a backup motor on my jet jon, but actually I thought it was cute. When seller ran it in bucket with prop off, it stayed relatively cool. I ran it yesterday pushing my boat & it got hot enough I couldn't hold my finger on the block. It spits water out of the exhaust relief port, but not a whole lot. I ran it with the exhaust port exposed (but inlet under water) & a modest amount of water is flowing (I would guess about 2000 rpm in picture). The water coming out isn't excessively hot, but again this is without load. What do you guys think? Am I going to damage the pistons by running it this way? If you don't have water coming out of it you will need a new impeller. With any old motor like that you should just assume it needs a new one (and several other things). Somebody selling an old motor rarely has done the proper maintenance on it. Shaugh - Thanks much for the info. Looks like I have some work to do on it. From the iboat thread it sounds like reduced water flow is a common problem. It's enjoyable to have an outlet for a lifetime accumulation of trivia. When you test it make sure the water depth is like when it's on your boat. Several inches above the intake. Those old pumps need all the help they can get. There are a few of us here that favor the Pre-1960 motors. visit the Antique Outboard Motor website and look at the "ask a member" forum. and yes !! those vintage motors are definately CUTE !!!!!!!!!!!!!!! If that is the depth you were trying to run the engine at in the bucket you may have damaged the pump impeller. The pump itself is located above where that gearcase bolts on to the exhaust housing. The pump should be totally submerged when testing in a barrel/bucket. Looking at that photo your water level should have been roughly another foot up on the engine to be safe. The water level in the bucket was above the water intake. Don't think it was starving. I ran it the mentioned plug out (this time full bucket) , still see only moderate flows. I took the 'impeller' out, doesn't look bad, but ordered a new one ($50!) anyway. Hope it will be an OK motor once I get past this. Don't think it was starving. And therein lies the difference. Knows vs. thinks. The pump needs to have water over the top of the pump in order to prime and start pumping. It has almost no suction. Add the fact that the aluminum housing is probably grooved and it has even less. This issue has been raised and spoken about many many times in here. One of us knows what he is talking about and is trying to help the other. If in doubt, read a member profile here and there, you may learn to trust what some of us are saying. 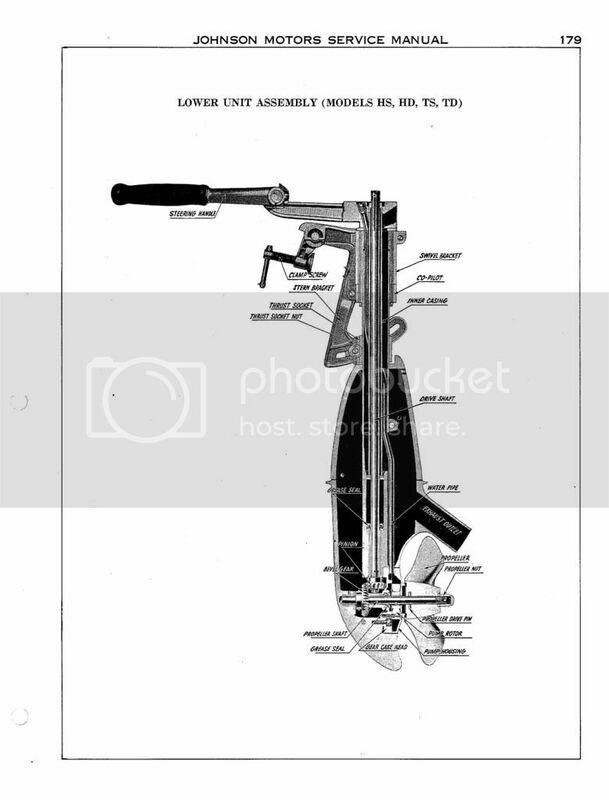 Well, here is the layout of the pump. The water inlet is at the top, so I am sure the plunger/impeller was fully immersed. It does not have a modern rotary spider type impeller. You are correct that the pump is right behind the prop. But that does not change the fact that it should be well underwater to work properly or to judge whether it's working properly. There can be no air bubbles or turbulence in the water supply. The pump is very weak and needs that few inches of water already in the system to allow it to pump at the level it was designed to. Getting water to climb all the way up that little water pipe is no small effort. I stand corrected on the pump location on that engine. Forgot and thought it was the same as the 3hp. Bury it well underwater, around the level I indicated earlier and do your testing. That style pump is pretty weak at best.